With the LG DLEX2801W dryer, the emphasis is not just on the fact that it uses True Steam Technology and that it has a 7.4 cubic feet capacity but also on how the technology and the size are used. There are 10 options included in this dryer model. If the capacity is used to speed up the drying chore then the True Steam technology is used to provide convenience options such as the Wrinkle Care, EasyIron, Antibacterial and more. 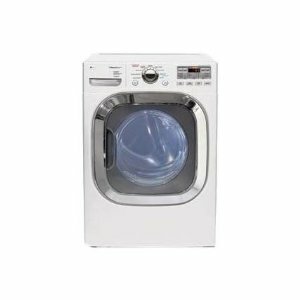 There are 10 very helpful options included in the LG DLEX2801W dryer. These options make drying less than ordinary. The options include the hygienic Antibacterial option, which could further heighten the cleaning power of the SteamSanitary Cycle. The cycle, however, is mostly designed for non-washables such as decorative pillows and childrenís toys. True Steam technology is effectively used to deliver wrinkle-free and clean-smelling clothes. There are several option and cycle combinations that can produce the same results. For example, the consumer can combine the EasyIron option with the SteamSanitary option to produce clean and wrinkle-free clothes. The same can be said for the Wrinkle Care and SteamFresh combination. The SteamFresh cycle is ideal for people who are always on the go or people who have just discovered some clothes that they have not worn in awhile. The cycle is designed to freshen up clothes that may have not been worn and washed for a long time. Then when the user does want to wear those clothes, he can be assured that the cycle will only last all of 20 minutes to provide him with clean-smelling and wrinkle-free clothes. The ReduceStatic option is another feature that can make the userís life easier. With the application of this option, clothes will no longer cling to the wearerís skin. The LG DLEX2801W is available in three colors: White, Riviera Blue, and Wild Cherry. So, there is an option for both the traditional and the avant-garde user. The materials used to build the LG DLEX2801W are chosen based on both their looks and durability. The drum is made of NeveRust stainless steel. The top plate is made of porcelain while the cabinet is made of painted steel. The dryer model uses intelligent front controls with LED display. The drying program can be chosen through a dial-a-cycle knob. The dryer is a space saver as it is stackable with a matching washer. The LG DLEX2801W dryer can produce clean-smelling, hygienic and wrinkle-free clothes that have been dried thoroughly. In short, it can deliver the results the user has been dreaming of. The dryer does not take a lot of extra space, being stackable with a washer. It is made to last, having been built with durable materials. Still, it comes with LGís one year warranty. Quiet operation and speedy cycles take away some of the stress from the chore of drying the laundry. The dryer model from LG is not Energy Star compliant.